Revell has brought back to us the revered Chevy Chevelle Z-16 with its awesome 396 cubic inch big block. First minted in 1998 and then again in 2007 as the 2 in 1 "California Wheels," this kit is a must for muscle car collectors. The model itself consists of a total of 121 styrene parts on 8 trees, plus the body. 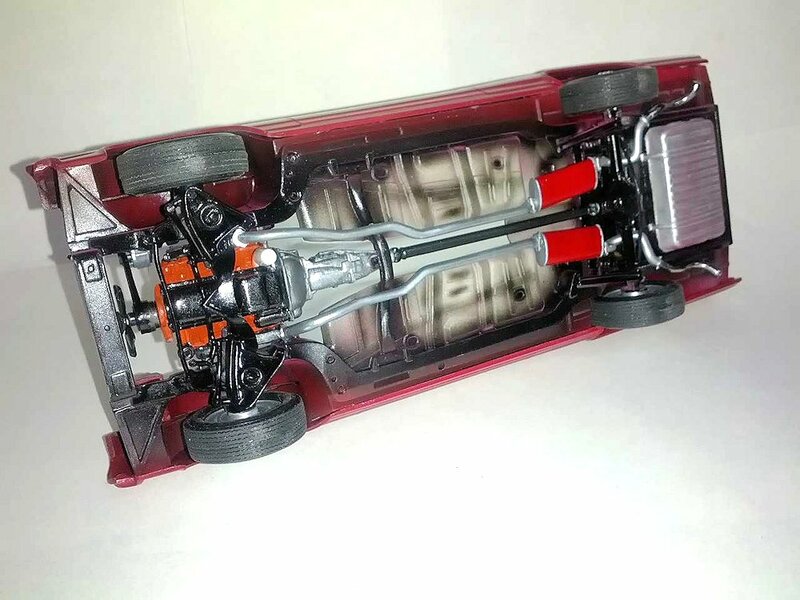 Four sprue and the body are molded in white, two sets in chrome, one in clear, one in clear red, and there are two sets of generic vinyl tires (stock and 22" customs). The decal sheet is in accurate register with 34 pieces, and sports options for both the custom paint and gauges. Also included are decals for the rotors which sandwich between the haves on the custom wheels. NOTE: They are directional, so you must match them to the tread pattern of the tires and then place on the correct side of the vehicle. Unfortunately, there are no calipers so I chose to paint mine on. This will also necessitate gluing the wheels on to keep the caliper in the correct orientation. Instructions are of the common vehicle layout with 15 steps and include a detailed list of all the parts and their description. This is a nice feature Revell started doing a few years back which is of tremendous educational value to the young modeler who maybe has never had the chance to look under the hood of a real car and figure out what all the "stuff" is. The 396 C.I. big block is a kit in itself, consisting of 26 pieces and two decals. All the accessories are separate pieces not molded into the block, and of special note are the distinct fuel pump, distributor, coil, and heater hoses. NOTE: The instructions call for painting the block and heads aluminum when, in fact, all the 1965 396 big blocks were steel and should be painted factory Chevy Red. (Really, orange.) 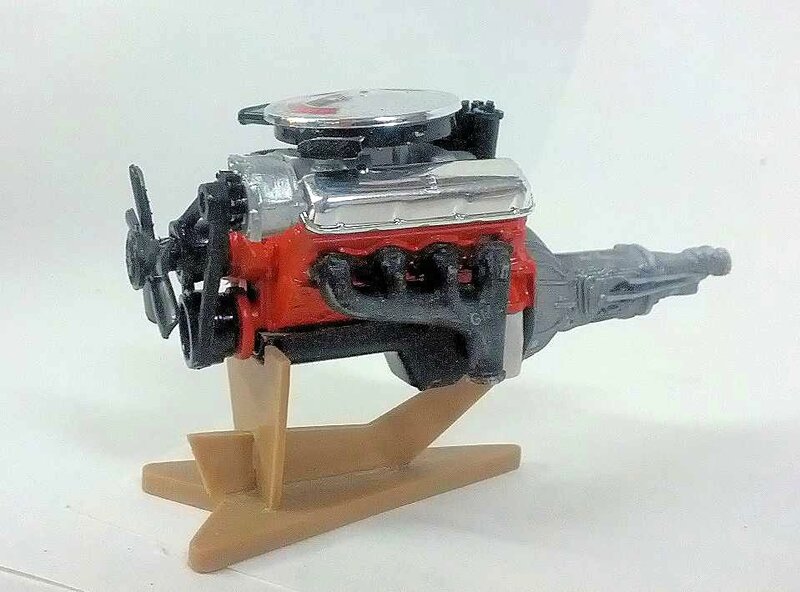 I painted my engine block O'Reilly Chevy engine red and the 4-speed transmission, bell housing, and intake manifold Model Master Metalizer non buff aluminum. While waiting for the sub-assemblies of the engine to dry, I turned my attention to the interior which consisted of 15 separate pieces and six decals. Small but noteworthy details in the interior include the parking brake, door locks, and decals for the gauges. I floated my gauge decals in with Future and they came out awesome. The only thing omitted was some seat belt detail, easily fixed but commonly missing on all Revell/Monogram car models. Moving on to the chassis, I like to paint mine as a whole, with small sub-assemblies like rear axles and exhaust fitting in afterwards. On the '65 Chevelle, I choose to paint the molded-in fuel tank first with Model Master Metalizer non buff aluminum, then masked it with Silly Putty and painted the rest of the chassis Model Master light grey. I then painted the perimeter chassis rails and cross members Flat Black and picked out some of the details with the airbrush. Then I glued in the front chassis and rear axle, which I had painted Gloss Black. I removed the mask from the gas tank and lightly sprayed the whole chassis the body color from a 90-degree angle, giving the chassis the effect of body overspray. Lastly, the shocks, wheels, and exhaust were added. Just a note on the exhaust - if you follow my sequence, the exhaust needs to be cut just behind the rear of the muffler and then reattached. I pinned my exhaust together to make it easier. At this point I begin the mid-assembly sequence, bringing together the interior, chassis, engine, and body, including painting and installation of the remaining interior detail, window glass, and engine bay accessories and driveline. Radiator with upper and lower hoses comes next, including heater hoses (seldom seen on car models). After this extensive assembly sequence, I was left with just the final trim assemblies. I installed the hood, front bumper with grille, rear bumper with tail lights, mirrors, door handles, and windshield wipers (of which many are chrome), using all purpose white glue. At this stage, the model is complete with the exception of five additional body script decals. I attached these as before, using Future floor wax as the wetting agent. I found this kit to be an extraordinary build just out of the box, with few, if any, fit issues. The thing I would change is the sequence of the instructions, or possibly offer some alternatives for the build. 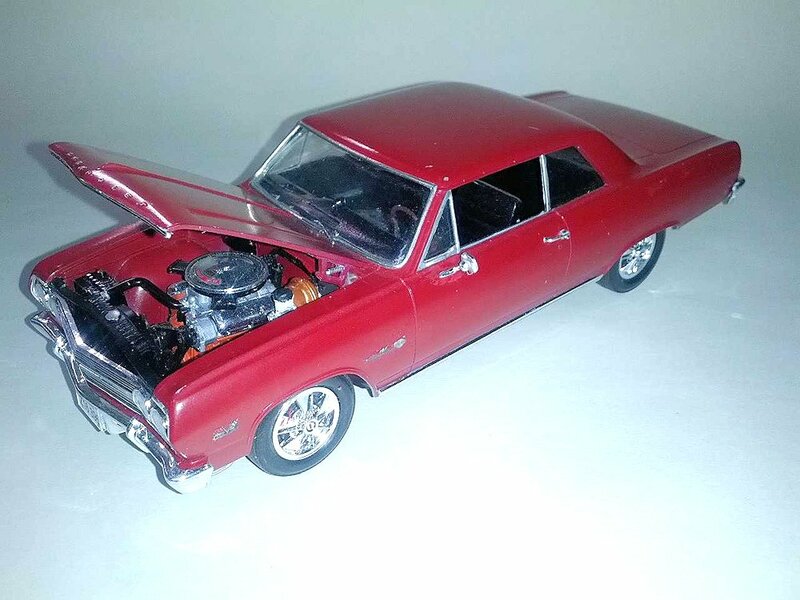 Overall, the details in the '65 Chevelle kit are fantastic, especially the Chevy 396 engine. Revell/ Monogram could easily make this a more attractive reissue by making it a 3-in-1 with an additional custom engine, wheel, interior and body options. Revell, how about a 572 CID big block pro street version? Thank you, Revell/Monogram and IPMS USA, for the chance to review the 65' Chevy Chevelle SS396 Z-16.